"Dedicated to the preservation, growth and development, expansion and creation of business endeavors built upon the highest standards of excellence and Christian principles beneficial in all ways to all members of the Canoy Group of Companies and contributing to the betterment and progress of the community and the society." 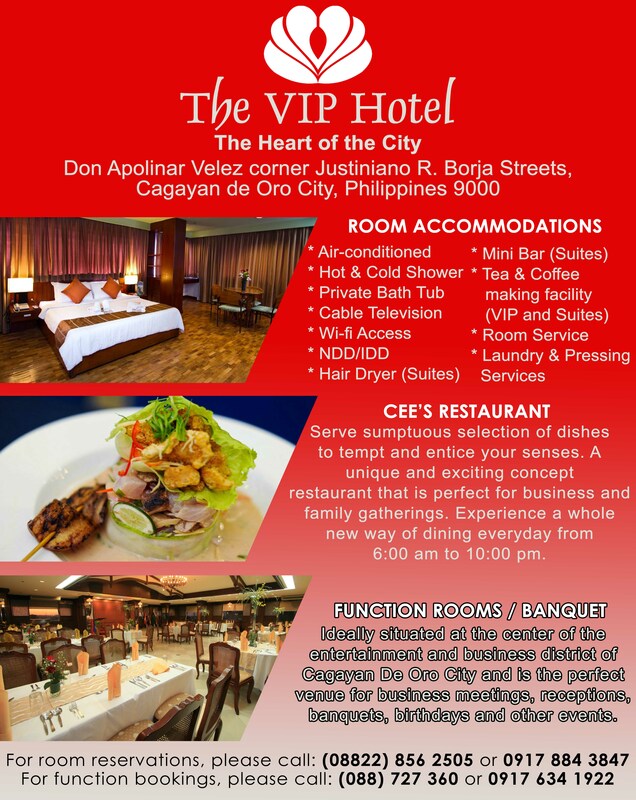 The VIP HOTEL is a two-level building – six (6) story with penthouse along Pacana Street and four (4) story along J.R.Borja street. The hotel features a spacious lobby with coffee-bar (Calle) and a restaurant (Cee’s). Strategically located as a business hotel, it has meeting rooms and function halls as follows: four (4) meeting /function rooms on the mezzanine, a conference/banquet hall on the 4 th floor (Mandana) with a Mindanao theme, and an elegant Filipino-themed hall on the 6 th floor (Casa Real). The Hotel has 79 rooms and suites, and a garden veranda on the second floor. Rooms are individually air-conditioned, hot and cold shower, cable TV, wi-fi access, telephones, mini-bars (suites) and standard guest amenities. The VIP Hotel (In the Heart of the City) continues to be the premiere hotel for small to mid-size conferences and events and known for good service and serving delectable range of local to international menu with some dishes from family heirloom recipes.